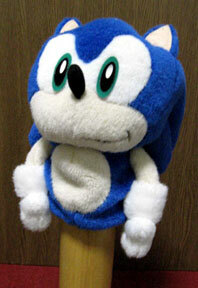 This page has only MODERN (post-Sonic Adventure-era) plush dolls. This page will have a focus on 2013-2015 plushes, likely from GE Entertainment, Nanco Nancy. With plushes showing up at offline retail stores and online at more places like Amazon & Target, (and Toys R US too) plush availability seems to be on the rise. Sonic Boom plushes will NOT appear here, as they have their own seperate page. What is this strange prize? 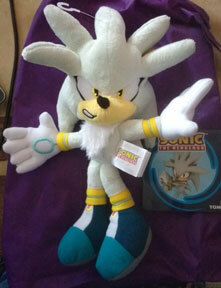 It's a Kelly Toy plush of Sonic, but made in all silver-tone fabric. All of him is the same color, except the bottoms of his (imporperly shaped) shoes & eyes. The eye color has also been changed to gray, to be more fitting for the fabric of the doll. Notice how there's no 'belly dot' in his pattern, it was simply eliminated because he is monocrhome here. Notice it still has their poorly design joices like floppy ears, bad brows, fat wrong-shaped feet & generally floppy appearance. It's Tomy's classic Super Sonic! Here are Tomy's new 'big size' classic style plushes on store shelves. They come in 'seat boxes' where the front & top are open & the doll is strapped sitting in the 'floor'. Notice the 'pixel holes' cut outs there in the top corner to continue their theme from their other figures & toys. 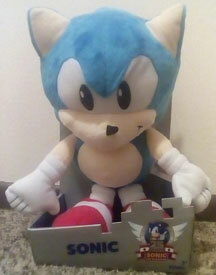 The plushes themselves are pretty good, with Tails likely being the better of the two. He's classic, cute with his 'center smile' & good bangs. 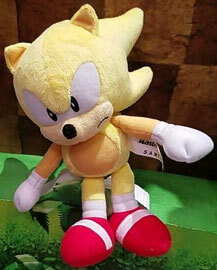 Tomy's Classic Style Super Sonic small plush is released! In early summer 2018, this small size doll appears in stores. You can compare it with Tomy's own toy fair photo above, on this page. But....it's also a bit of a mystery. 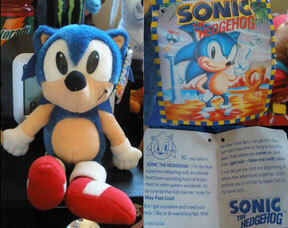 Certainly, there were old, classic official Sonic puppets but a modern one? Where is it from? Is this really a USA item? If so, where was it sold and how much was it? Was it part of a set or something? Here is another photo for Tomy's upcoming plushes in 2018. 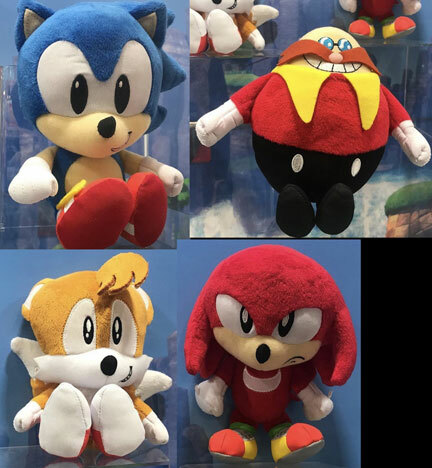 They're all from the line of "Pose Plush" except the Knuckles, who belongs with their classic line. Notice how each of the 'pose' characters has arms that are 'doing something'. The Shadow has one open hand and one fist, also one elbow is bent & he's clearly looking off to one side. The Tails has both elbows bent, and one arm is naturally raised. Silver is perhaps the most dynamic out of everyone here, and is actually quite interesting. They've actually got him gesturing with his psychic palms as he does in the game. The chest fur piece is actually large too, and dimensional. His expression is rather aggrivated, though. The classic Knuckles is their weakest offering, look at his tiny, flat fists. There's even an un-quality thin lame folded-over thumb there too. He's odd to see, because the 'pose plush' do such a good job in this case, but they completely under-value his...well...the feature he's named for: Big fists & knuckles. Here's the turn-around for Tomy's Vector plush. He's ok, especially when considered from all sides. 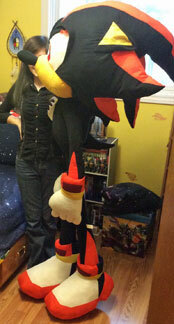 Though, he's not that large and is generally around 15 or 16 dollars. This shows how extra-long the arms are & that the legs are really determined to be sticking right out of the sides of the body. His details are all there, like 3D spikes, the chain, headphones & shoe/glove/buckle details. The tail is sculpted with a bit of a curve, and one hand is doing a thumbs-up. His eyes are meant to be having a bit of an expression. These photos are taken in a Target store, where you MAY be able to find these, if they can keep them in stock. In all it's an 'ok' plush of a less common character. Nothing super amazing, but not terrible either. He's not going to take up a lot of space, but is slightly costly for the size and quality you get. It's time to dare to compare again with Kelly Toy character sizes. 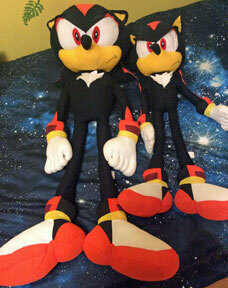 This time, it's their Shadow plushes. The larger one here is the 32 inch, while the smaller is their 28 inch. Many people claim that 'all their size is from making the legs super noodly-long', but this photo proves that's not entirely true. You can see that the body, shoes & head are substancially larger. Kelly Toy, being a prize-plush maker was never too big on pattern perfection, which is exposed here because his shoe soles have no details & the ears are somewhat floppy. His eyes are too close together (as usual) but the glove/shoe and arm/leg color details are all present. One of the first things to go off of a plush is the paper tag. After all, it doesn't have the durability of fabric. So, here's a nice look at Caltoy's famous Sonic's paper tag. It was a fold-over with a blurb inside so now you can finally know what it says. "Hi my name is Sonic the Hedgehog, I'm the blue superhero hedgehog with an attitude that's been providing hours of enjoyment to video-gamers world0wide. It's no surprise that kids love me cause I'm Way Past Cool! But I got a problem and I need you help. I like to do everything fast. With my Super Sonic Spin, I can get lots done but I don't have the time to hang around this place. T hat's where you come in and how I get out -- take me with you! It will be just you and me beginning a whole new adventure together. And I promise you it will be fantastic fun or my name isn't...Sonic the Hedgehog! 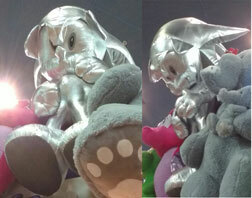 Here's Tomy's Silver plush in-store. The ears barely have any border, and the nose is somehow super tiny? (Usually 'big nose' is a problem, but this one has a micro nose that's also pretty flat/sewn on flat at the base) Where are his legs? You have to assume they're a bit folded / perspective of the box is messing it up, but the box should enhance the doll, not hide a feature. His fingers are pretty simple (just thread dividers on the glove surface) and short, which is a little unusual for a plush of this size. The face proportions / eye shape & spikes seem good, leaving the nose as the only big issue. It's not a terrible plush by any measure, the fabric quality looks good, the size is nice, & the pixel-edge look box/seat is fun too. This was supposed to be at Toys R Us in the USA, but where is it now? 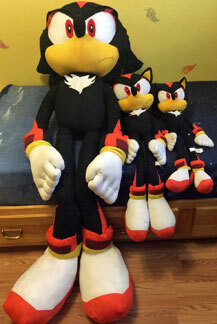 This is Kelly Toy's BIGGEST (known) Shadow plush, at a whopping 70 inches! (That's 5 foot 8 inches) He's super big...and actually pretty cool. The giant size means the shoe & glove details really work. They also couldn't skimp on the hands/fingers size/proportion and detail, either. The head shape is even good, as are the spikes. The ears are simple flat triangles that flop down (too bad) but the eys, expression & lower face are good. Opinion zone: I consider this "Life Size", and thereby, feel it is cooler than other dolls. I never really thought Sonic characters looked 'right' when they were these dinky, 3 foot high "tiny animals" type portrayals. Having them as tall as a regular human alwasy looked/felt more "realistic"* to me,..so these giant dolls are automatically cooler. The temptation to modify it would be there as well, like fixing the hands into having individual fingers, stuffing it with polyfill in the body or maybe adding 'funnoodle' strips to make it pose-able so it becomes more like a soft action figure to pose for fun photos or just to be able to stand out of the way since it takes up a lot of space by its very nature. Keeping a giant plush out of harms' way (harm being sunlight, moisture of the air, dust, pets, toppling off of stuff, powdery mildew, or any of the problems that can beset fabric) is also a consideration in collecting. However, something like this is a great collection centerpiece & a rare prize to own! *I have no idea why. They are very abstract characters no-matter how you slice it. And...they're not that great? For a first offering that's supposed to impress, this set isn't doing it. They're another "stylized" set where it's the classic characters but with tiny bodies/arms and big heads which has already been done better, by others. Then, there's actual innacuracies going on! Look at those terrible NOT belly-dots for Sonic & Super Sonic! That's a BOOTLEG level mistake! The belly color is a CIRCLE ALWAYS, and they look dumpy & fat because it's not. Then, the chest white mark for Knuckles isn't a crescent & Tails...they just messed his color up totally with like an odd white 'bib'? What is going on with Eggman's face? Do they have his glasses as eyes looking sideways? And his arms are growing out of his...ribs? These things are bonkers without getting started on Sonic's failing spike details, & Knuckles bad looking giant eyes. 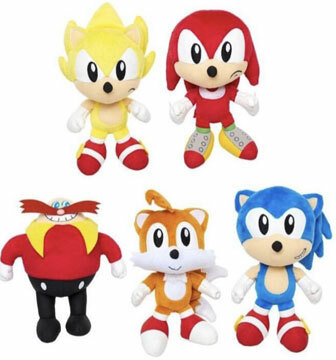 Super Sonic has 2 eyes as well & Tails' eyes are wrong, even for classic style, plus his color is kind of too brown. This set is just about a mess. Very disapointing, and hopefully not an indicator for Jakks Pacific future in Sonic stuff. This is an 'updated' set of the Jakks Pacific 'little big heads' plush dolls. Yes they're still SD Proportioned (is it because making real proportions was too hard for them?) and there are SOME improvements over that pretty awful looking trash set above. They fixed the belly dot into an ACTUAL dot, not that bugs-bunny-bootleg thing where it connects to his neck and makes him look fat/stupid always. The face is about the same, and the ears still stand up. Still can't tell how the spikes are without a back view, but he is actually improved. They've done...something with the collar/yellow part for some reason? It's still fine. He seems more circular/classic shaped, but there's still the oddball head construction & strange glasses-glint that makes them look like eyes when they're not. He's improved, but mostly by the better/right arm position. still not amazing nor terrible. WELL. He's...less strange? He both got better AND worse with this edition. The mouth is like super WRONG. The toothy side smile is never anything he has, so it looks 'Knuckles-like' and bad on him. The 'center smile' the previous version had was a lot better. This expression makes the plush look cheezy. The eye shape & black parts are much-much improved though. The original was so bad it looked like a bootleg. The chest patch/edges remains to be seen because it is hidden here where it wasn't before. The laid-back ears are a definite minus, as is the raggedy cut on the bangs-shape that's wrong anyway. Still poor, but improving. But not particularly least, because his eye shape is MUCH corrected. He looks a lot grimmer with the difinitive frown, but it's better than the awful first set of eyes. They also corrected the chest crescent into the appropriate shape. Something's been doen better with his spikes too, and the fists may be bigger. As long as they kept the good shoe detail, he could be all right. Will these go through another revision?